While this new trailer for The Three Musketeers doesn’t give me total faith in the film, it’s about ten times better than the previous one. The plot is explained further and we get to see more characterization, but I’m still not sold. Specifically, we are introduced to the villains: Cardinal Richelieu (Christoph Waltz), the Duke of Buckingham (Orlando Bloom), and M’lady De Winter (Milla Jovovich). 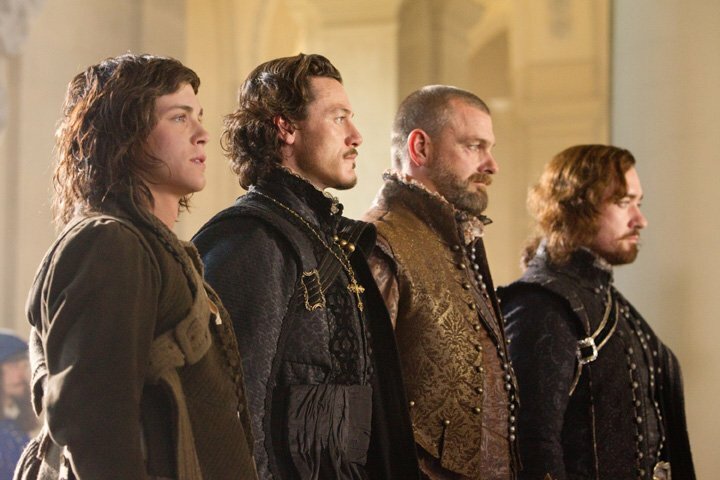 Matthew MacFayden, Ray Stevenson, and Luke Evans play the three musketeers – Athos, Porthos, and Aramis – in that order and the lead, D’Artagnan, is played by young but up-and-coming actor Logan Lerman. D’Artagnan is a foolhardy young gun who tries to reunite and motivate the three musketeers to prevent war in Europe. According to the trailer, a whole bunch of crazy stuff ensues, like blimp fights, slow-motion cannons, and seriously hideous hairstyles. Paul W.S. Anderson (Resident Evil, Alien vs. Predator) is directing, and Andrew Davies (Bridget Jones’s Diary) wrote the script. Quite a combination. Maybe this unique blend will turn The Three Musketeers into an over-the-top action film with quirky, relatable humor. Or it may all just become one huge mess of a film, who knows? By the way, Jovovich and Bloom physically look fantastic, but they somehow managed to make Waltz look disgusting. I guess he can’t always play such a magnetic villain. The hot-headed young D’Artagnan (Logan Lerman) joins forces with three rogue Musketeers (Matthew MacFadyen, Luke Evans and Ray Stevenson) in this reboot of Alexandre Dumas’ story. They must stop the evil Richlieu (Christoph Waltz) and face off with Buckingham (Orlando Bloom) and the treacherous Milady (Milla Jovovich). The action adventure is given a state of the art update in 3-D.